* Families with more than 1 child registered in a Spring, Summer or Fall season receive a $25 discount for every child after the first. *** For DHYS Spring and Fall programs, the fee covers: jersey, hat, belt, socks, field usage, umpires, insurance, trophies as appropriate. Druid Hills Youth Sports (DHYS) is an all-volunteer organization for boys and girls and has been around for over 50 years. For boys, we are baseball only. Girls can play either baseball or softball. There are several “seasons” of baseball each year. Please see the baseball chart or the softball chart for the different programs/camps/clinics and how they relate to each other. A player’s calendar age is not necessarily his baseball age. Baseball age is determined by answering the question: How old will the player be on April 30? Softball age is determined by your birth year. Costs differ for each season and age. Payment is due at the time of registration. If you register and don’t pay, your registration is deleted. Registration for the next season begins immediately following the end of the previous season. For Rec seasons, we play at Medlock Park and Kelly Coffer Park. See How to Get Here for directions to Medlock Park. Kelley Coffer park is in Tucker, right by the high school, and is 20 minutes from Medlock Park. 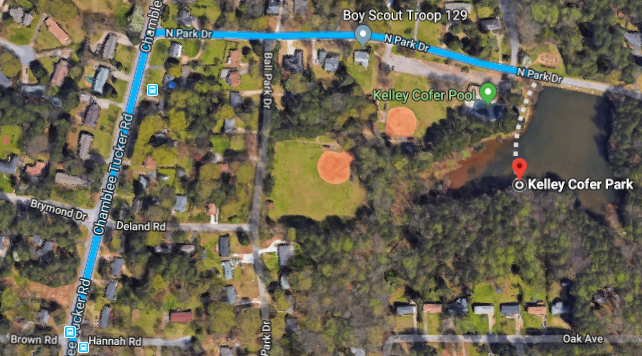 See directions from Medlock Park to Kelley Cofer Park. See satellite image of Kelley Cofer Park. Glenlake Park is used for Rookie. See directions from Medlock Park to Glenlake Park. It is a 5 minute drive. Decatur First Baptist Church (FBC) is used for softball. See directions from Medlock Park to FBC. It is an 8 minute drive. The schedule varies from season to season. Except for All-Stars and Softball Select, we hold evaluations to determine the skill levels of the players. Everyone who registers will be accepted on a team, unless the league is oversubscribed or unusual circumstances dictate not accepting a player (determined by the Board of Directors). For All-Stars and Softball Select, it is competitive and not everyone makes the team. We hold “drafts” for each season, other than Tournament Teams (aka All-Stars) and Softball Select, which are determined by tryouts. Players are not guaranteed to be on the same team, with the same coach and their friends. The drafts make for more balanced teams. We may honor player requests, if possible (e.g., can my player be on the same team as so-and-so because we live on the same block and I need help to get him there). It is more likely at the younger ages. Spring: Evaluations are in mid-late January and the season ends in mid-late May. Middle school: Competitive tryouts are held by the schools and DHYS also sponsors at least 1 “In-Park” team, usually 2 (the Warriors and the Warhawks). Tryouts for the "In-Park" teams are in January. Summer: No evaluations. The season is June and July. Registration usually opens May 1. Fall: Evaluations are in August and the season is in September and October, usually ending by Halloween or the first weekend in November. All-Stars: Tryouts are in April and the season is from Memorial Day through mid-July.